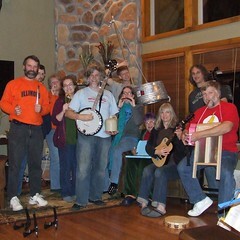 ...and our rendition of Duelin' Banjos for banjo, jugs, gutbucket (washtub bass), spoons, kazoos, xylophone and the three-headed guitar. Turn on closed captioning to see who's playing what. What a joy to see and hear a family having so much fun! Thanks for sharing! Marlene Bucherer Park, MHS Class of 53.